Do Chinchillas Need Dust Baths? Are They Necessary or Can I Skip Them? There are a lot of pet care tips you can choose to follow to help spoil your pet, although it’s important to be able to decipher which tips are absolute necessities are which are just nice to do. So? Is it an absolute necessity to give Chinchillas dust baths? Do they actually get dirty in their cage and dust the dust actually help or am I just waiting for my money on another product? Dust baths are 100% necessary to keep your chinchilla happy and healthy. What do Dust Baths Do? Bathing in dust is actually something chinchillas do in the wild. Chinchillas do this to keep their fur/coats healthy and clean. You’ll notice that your chinchilla has thick and hopefully very soft and smooth fur, to keep it this way they’ll have to toss around in some dust. Bathtime is one of the cutest things to watch. Can I use any dust? 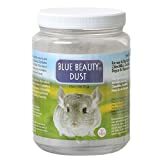 No, you’re going to want to make sure that the dust is made specifically for chinchillas. 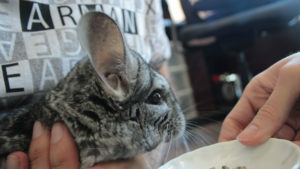 Chinchilla specific dust will make sure to remove the oils and dirt found in your chinchilla’s fur. Chinchilla dust is actually made to replicate volcanic pumice, which is what they would naturally roll in. How much dust you put in will depend on the preference of your Chinchilla. Some folks recommend a few inches, however, we always put in about 1/4 a cup in Gary’s bath. Photo from How High Do Chinchillas Jump? Do They Jump Higher than Cats? Do you have a favourite dust bath? 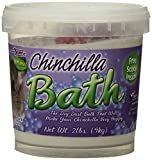 What’s the best kind of bathtub for my Chinchilla? Can I use a regular bowl? I would recommend against using bowls and look for something heavy and lidded. Chinchillas can get fairly wild when they are cleaning themselves. 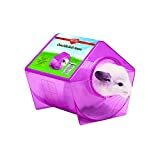 Alternative for Chinchilla specific baths can be fishbowls or cleaned out canisters. Some people will recommend wooden baths like Green Farm Chinchilla Bath House Hideout and while I love the look and think it would be great for chewing on, I don’t know how much I care about the usefulness since I wouldn’t want Gary pooping or peeing in it. I guess you could hope that he doesn’t poop or pee in it when there is no dust in the bath, but I feel like it’s a bit risky. Anyone leave this in their cage 24/7 have an opinion? How Often Should I Change the Dust in the Bath? The safest thing to do is to always change the dust in your chinchilla’s bath, although you can also get away with using it a couple of times before discarding. I would check to make sure that your Chinchilla hasn’t defecated in the dust. Dependent on how long they bathe, or how nervous they are while bathing your little one may poop a lot in their dust baths. Gary will poop once every 2 or 3 baths, so we make sure to wash and clean the tub regularly. Do I Give a Dust Bath Every Day? No, there’s no need for that. Actually, the bath should be completely removed from the cage when it is not in use (or else your Chinchilla may accidentally mistake the dust bath as a litter box!). Give your Chinchilla a bath every other day or every three days, based on how dirty they get. I would recommend giving them a bath in the evening when they are most active, however, Gary seems to be awake in the very early mornings when we wake up, so that’s when we give him a bath. Baths can take as long as 15 minutes at a time. So a good opportunity for your Chinchilla to take a bath can be when you’re cleaning out their cage. 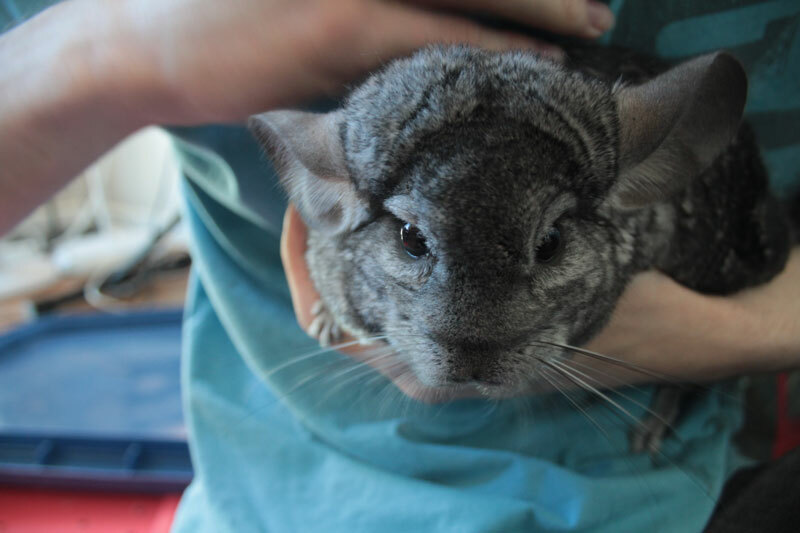 How Do I Tell My Chinchilla needs a bath? There are a few ways to tell if your Chinchilla needs a bath. First, touch your Chinchillas fur. Does it feel damp? Is their fur excessively oily? Does their fur look rough or scraggly? These are all signs of your Chinchilla needing a little extra TLC. Now on the other side, if your Chinchilla’s skin is dry or flaky you will want to give your chinchilla baths less frequently. Your Chinchilla should not have any signs of dander and should not have to itch. 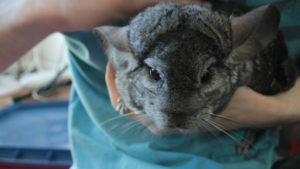 Photo from How Big Do Chinchillas Get when They Are Full Grown? How Large Do They Grow in Size? Does Weather affect how often you bathe a Chinchilla? Absolutely, when things are a bit more humid, you’re going to run into a Chinchilla who’s fur retains too much water. Make sure you’re checking your Chinchilla’s skin and fur daily as you feed them to make sure that they are getting enough bath time! Should you ever use water on a Chinchilla to clean them? Absolutely not! Water will harm their fur and will cause it to clump/matte. 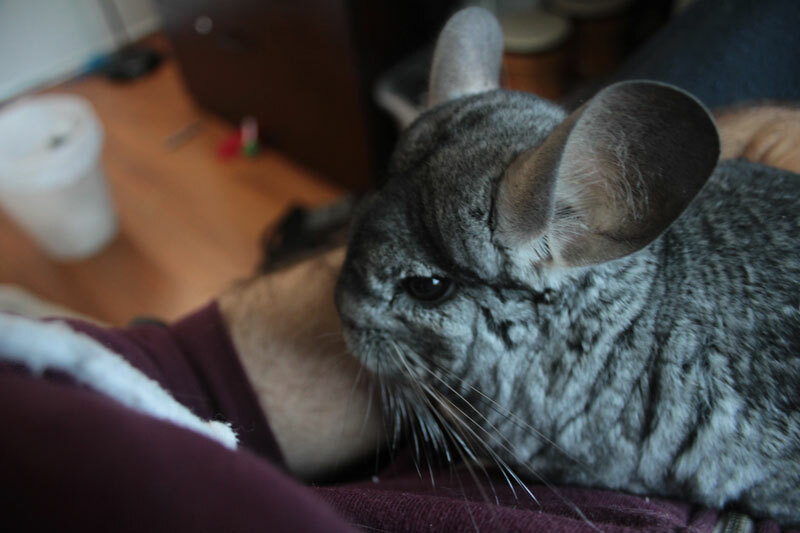 Fun fact: Chinchilla’s have about 60-80 hairs per follicle, while humans have 1 hair per follicle. So, with that information, we can safely assume that wetting a Chinchilla’s fur will make it clump and will take a very long time to dry. Wait, sick? How can water make my Chinchilla sick? Well, I’ve already said that water may cause the Chinchilla’s body temperature to drop, but it can also lead to things like bacterial or fungal infections. Okay, okay… but I spilled something sticky on my Chinchilla… is the dust going to take care of it? Perhaps. I would definitely try the dust before you hose down your Chinchilla, but if you take a slightly damp cloth and wipe your Chinchilla gently, you should be able to get rid of the mess. 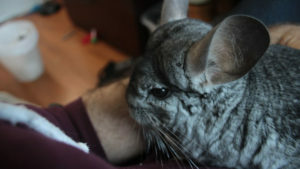 That being said, try not to touch your Chinchilla’s skin and focus only on the fur that’s been affected. Will my Chinchilla understand that this bath is for them? I can’t say if Chinchillas ever have difficulty understanding that their bath is for them as Gary was a surrender we adopted and already knew how to use his bath, but I did a bunch of reading to see if there was any helpful advice to give you. 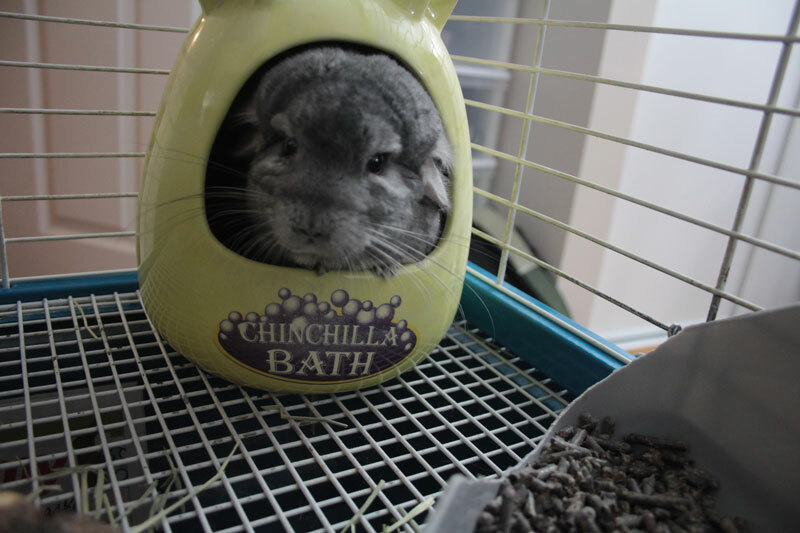 It seems like most folks don’t have issues getting their Chinchillas to use their baths. Similar to cats, you may have to place them in front of the bath (or litter in that cat’s case) and let them sniff around so they understand what’s going on. Since the chinchilla dust is made out of pummace, they should already understand what that texture is for. I’ve Noticed my Chinchilla is losing a lot of fur, what’s going on? 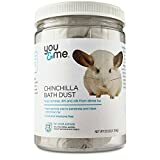 Well, this can definitely stem from giving your Chinchilla too many baths, but it can also be the opposite (and quite commonly is because of sickness caused by a dirty living space/not enough bathing). Remember those skin/bacterial infections I mentioned before? One of them is actually ringworm that can actually cause your Chinchilla to lose their fur. Please make sure to inspect your Chinchilla every time you feed them. I can’t stress how important this is. If you notice any changes to their activity level or notice a loss of fur, please make sure to take them to the vet immediately. How Long Does a Chinchilla Live? How long is their Lifespan? What do Chinchillas Eat? What Should I Feed My Chinchilla? How High Do Chinchillas Jump? Do They Jump Higher than Cats? How Big Do Chinchillas Get when They Are Full Grown? How Large Do They Grow in Size? 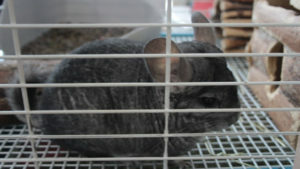 Pretty sure The Hubby isn’t going to allow a chinchilla in the house, but they seem adorable!